Virtually all farms in the United States are family operations, many of which have been passed down through multiple generations. 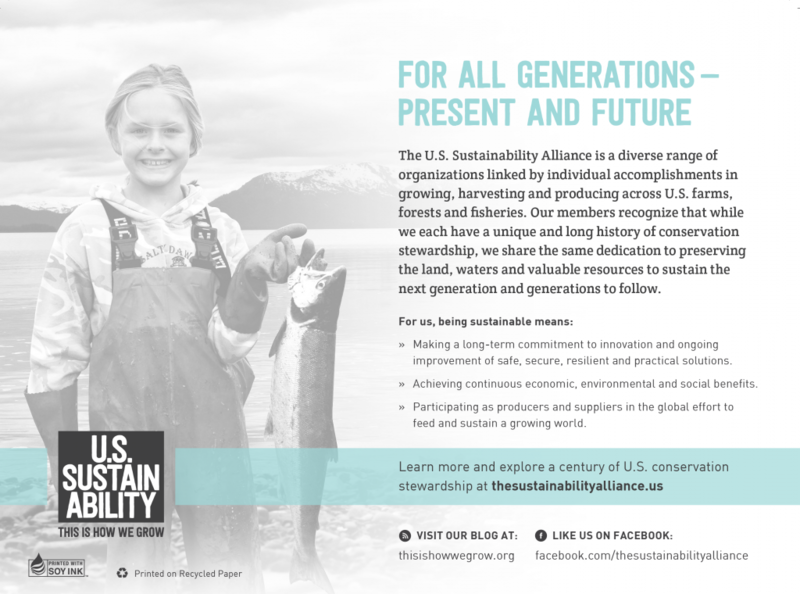 U.S. farmers raise their families on the land they farm, making protecting soil health and water quality even more important. As a result, farmers continually seek out new processes and technologies to preserve these precious natural resources. According to the Fertilizer Institute, farmers grew 14.22 billion bushels of corn in 2014 using less than 1.6 pounds of nutrients (nitrogen, phosphorus and potassium) per bushel produced – a 114 percent increase in production since 1980 using only 4.5 percent more nutrients! Increasing production while lowering inputs per production unit and preserving natural resources demonstrates the sustainability of U.S. coarse grains operations. These improved efficiencies also contribute to sustained profitability of U.S. farms, ensuring operations and rural communities stay viable for current and future generations. 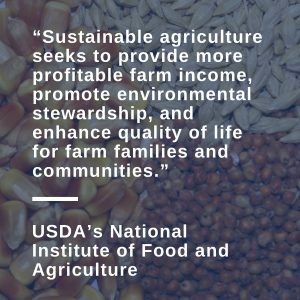 This webpage provides information and resources on the practices and technologies that contribute to the sustainability of U.S. farms and agribusinesses. For additional answers or information, please contact the Council at grains@grains.org. Producing more, using less. U.S. farmers and agribusinesses are increasing efficiency and yields while using less inputs and improving the soil health and environment in which they raise their families. Modern production practices, including low-till and no-till planting, result in reduced energy consumption, less soil loss, fewer pesticide applications and reduced greenhouse gas emissions. Coupled with advanced breeding techniques and biotechnology, farmers are increasing high-quality coarse grain crops each year while conserving precious natural resources. and decreased greenhouse gas emissions per bushel to 12.9 pounds CO2e per bushel in 2015 from 18.5 pounds CO2e per bushel in 1980. 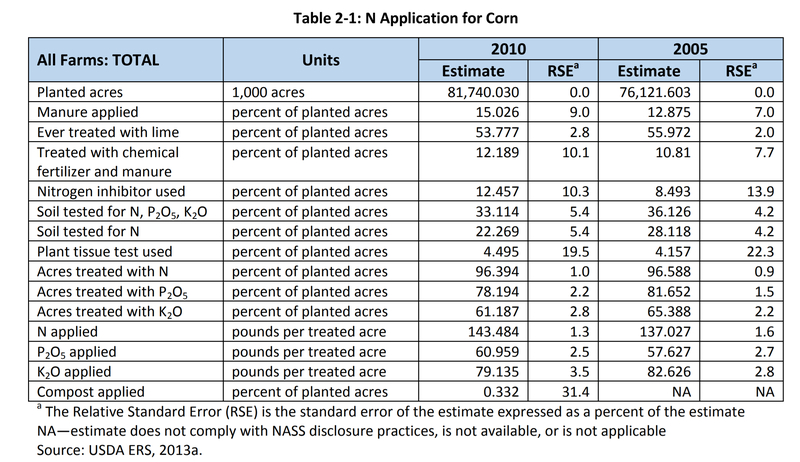 Chart comparing nutrient applications for U.S. corn between 2005 and 2010 from the U.S. Department of Agriculture, Economic Research Service. Thanks to these improved farming efficiencies, plant technology and growth in markets for co-products like distiller’s dried grains with solubles (DDGS), U.S. corn-based ethanol has improved its greenhouse gas emission (GHG) reduction scores over time. 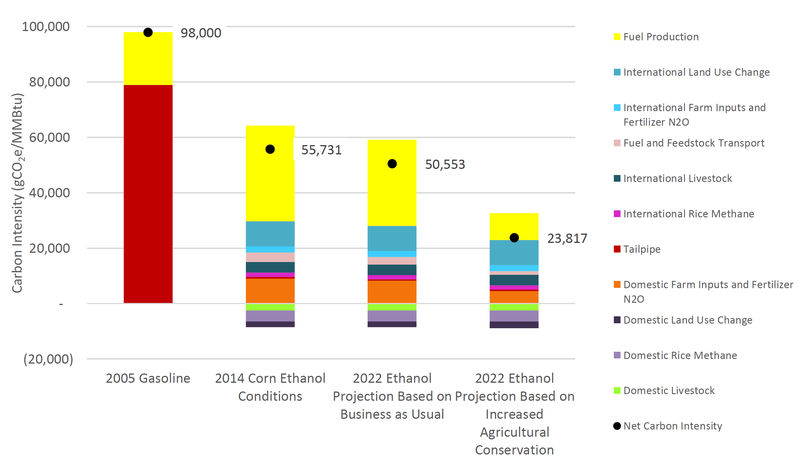 According to an updated life cycle analysis by USDA in 2017, GHG emissions per unit of corn-based ethanol were about 21 percent lower than average gasoline in 2005. Naturally drought-tolerant U.S. sorghum also helps farmers in water-stressed areas, and the ethanol producers that utilize sorghum produce more while using less water reserves. The Sorghum Checkoff, the U.S. Department of Energy and the U.S. Department of Agriculture have also invested in developing next-generation renewable fuels using biomass and sweet sorghum, which are efficient convertors of solar energy to sugar.